Question how much do those GS2's normally go for, we have one in our garage. I also have a Yamaha GS2 in fairly good shape; it does need some repair (the tone generator has something wrong because it doesn't make the correct programmed or pre-stored sounds; one time it started working fine again, but I can't guarantee that); I have a complete service manual for it (like new --with all the schematics). I also have a complete set of all the voice cards along with blanks to make backup copies,etc. I would like to sell or will consider donation to a legitimate non-profit organization such as a music museum, etc. It does work as a very decent midi controller / keyboard, but of course thats not really the point of a GS2 -being that is was a very early YAMAHA FM synthesizer with all those classic 80's sounds and great Yamaha keyboard sounds all mixed in. If interested, please let me know. Thanks! I finally got my GS-2 working with a great amount of help from Doug @ synthark.com. We worked together to find a battery-backed memory that will store the voices. They were able to reload 16 voices into the CPU board (since my card reader doesn't work--I am still trying to fix it). Doug hopes to create a daughter card for GS2 (maybe GS1 too) since many of these keyboards work but the card readers have failed and some of the chips are hard to get. I am still interested in selling my GS2 or donating it to a good cause. @William Carter.. these are very rare and I would think the GS1 would be very valuable if still working. 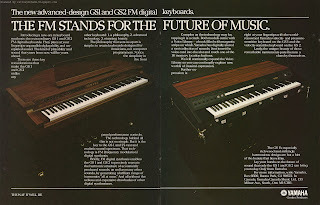 I am not sure how to assess value, but you could let synth ark know as they have a museum and may know if someone is interested in one. I have 3 books/ volumes of the sounds if interested, so I may have some you don't have. Let me know. OptimisticCurmudgeon, do you still happen to have any presets strips?